Shahab Ahmed (d. 2015) taught at Harvard University as Professor of Islamic Studies. One of the most controversial episodes in the life of the Prophet Muhammad concerns an incident in which he allegedly mistook words suggested by Satan as divine revelation. Known as the Satanic verses, these praises to the pagan deities contradict the Islamic belief that Allah is one and absolute. Muslims today—of all sects—deny that the incident of the Satanic verses took place. But as Shahab Ahmed explains, Muslims did not always hold this view. Before Orthodoxy wrestles with the question of how religions establish truth—especially religions such as Islam that lack a centralized authority to codify beliefs. 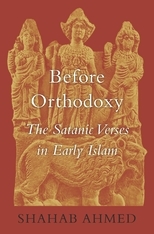 Taking the now universally rejected incident of the Satanic verses as a case study in the formation of Islamic orthodoxy, Ahmed shows that early Muslims, circa 632 to 800 CE, held the exact opposite belief. For them, the Satanic verses were an established fact in the history of the Prophet. Ahmed offers a detailed account of the attitudes of Muslims to the Satanic verses in the first two centuries of Islam and traces the chains of transmission in the historical reports known as riwāyah. Touching directly on the nature of Muhammad’s prophetic visions, the interpretation of the Satanic verses incident is a question of profound importance in Islam, one that plays a role in defining the limits of what Muslims may legitimately say and do—issues crucial to understanding the contemporary Islamic world. Hommage to the late Shahab Ahmed by Noah Feldman and Beena Sarwar. Introduction : How Does Truth Happen ? 1. How to Read the Earliest Sources ? 3. Why Did the Early Muslim Community Accept the Satanic Verses Incident as Truth ?